Did you know that the St. Johns Center for Opportunity provides fiscal sponsorship for a number of community events and grassroots organizations in St. Johns including The St. Johns Bizarre, Celebrate North Portland and the St. Johns Museum? Fiscal sponsorship is when a non-profit extends their liability and tax exempt status to projects or events that align with their mission and values. This allows grassroots community groups or events to fundraise under a non-profit umbrella, get administrative support and, ultimately, flourish in our community! 9 years ago, Mike Verbout saw a need to recognize and celebrate the incredible leaders and organizations who have helped define and support the St. Johns community. He, along with a committee of longtime community members, created Celebrate North Portland, an awards ceremony highlighting community leaders held at University of Portland each spring. 12 years ago, a group of community members wanted to encourage folks to hang around and enjoy the St. Johns community after the historic St. Johns Parade, so they created the St. Johns Bizarre, a festival of music, food, art and community in the heart of Downtown St. Johns. 12 years strong, the event now features over 100 local vendors and 12+ musical acts on 2 stages. 2 years ago, a group of St. Johns residents saw a need preserve the rich history of our neighborhood by gathering, organizing and displaying community artifacts. Through the hard work of the volunteer committee, they’ve collected hundreds of photos, documents and stories about our history. 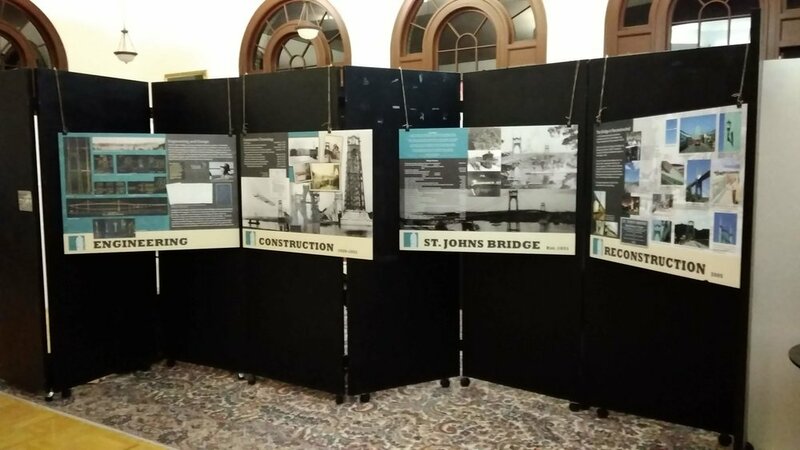 They’re currently searching for a permanent space to display the collection and celebrate the history of St. Johns for generations to come. Fundraising & administrative support from SJCO is key! Each of the organizations talked about the incredible relief and time saving they get from having SJCO support with accounting, bookkeeping and fundraising efforts. Lindsay provides all accounting and bookkeeping for donations and expenditures, which frees up the volunteer committees to focus on other aspects of their events. “If we didn't have them as our sponsor we would have to obtain our own 501(c)(3) number and task accounting support to a volunteer. For an aspiring non-profit these are huge time crunchers”. -St. Johns Museum. Also, having the non-profit umbrella for fundraising efforts means that each of these organizations can apply for grants and provide tax incentives for donations to their events. As Shamus explained, “It has really amplified our fundraising abilities. I don’t think it’s a coincidence that we’ve been able to raise more funds over the last 4 years because of the help we’ve had from SJCO”. Each of these events have also been able to increase their budget, their scope or their scale during the time they’ve worked with SJCO as their fiscal sponsor. According to Mike Verbout, Celebrate North Portland has increased in scope to include a wider range of North Portland leaders being recognized in the awards ceremony due to the support of SJCO networks and outreach. He explains, “With SJCO onboard, the diversified outreach that is there... adds a rich dimension to the goal of a more comprehensive inclusiveness in the event”. No longer just a St. Johns focused event, it has grown to include other North Portland leaders. Likewise, the St. Johns Bizarre has grown from a small party in the plaza to now include 2 beer gardens, over 100 vendors and 2 music stages across 6 city blocks. “It has become one of the biggest community events in St Johns, so a lot of that has been able to take place because of the solid support we get from SJCO!” By providing guidance, structure and time saving accounting support, SJCO has given each of these organizations an opportunity to thrive in the community. 3. SJCO is more than just a fiscal sponsor, they’re a great partner! More than just administrative support, these organizations see SJCO as a true community partner. Whether through event planning support, access to a storage unit and meeting spaces, increasing outreach capacity to a wider range of neighbors and organizations or having strategic conversations about next steps as an organization, SJCO is there. As Mike explains it, SJCO asks “how can we support you, how can we be a team player? I think that allows for greater success for SJCO and the groups for which they are a team player”. The St. Johns Museum reflected on this saying, “Huge thank you to SJCO! They are more than a fiscal sponsor and provide us with business support too!”. Fiscal sponsorships are one way that the St. Johns Center for Opportunity supports a thriving, diverse and just community where all community members can thrive. Help us continue to offer this service to our community groups. Stand with us to bring access, hope, and a voice to all of our community through a donation to SJCO during our End of Year Campaign.